Decorating our home for Halloween isn’t always top on my list of things to do. I couldn’t write “has an eye for design” on my resume. But putting together my 13 Cheap Halloween Decorations Easier Than Screaming in a Haunted House post inspired me. There are plenty of ideas out there that cost little to nothing. And they’re so easy that even I can do them! Did you check out last week’s 5 Ways We’ve Saved Money This Week post? 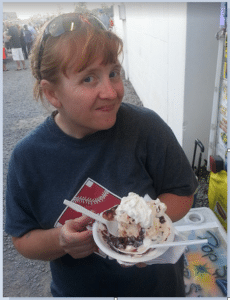 It was number 52…a big deal for me! That’s a full year of money saving tips. Check out that special edition here. Or find all of the old posts here. Now…the 5 Ways We’ve Saved Money This Week. We usually shop at Advance Auto Parts for our car parts. Speed Perks members take $25 off orders over $75 with code A124 at AdvanceAutoParts.com! That’s a pretty good deal, especially if you want to have supplies waiting for your next maintenance job. This is our biggest savings of the week! I introduced the potty to our son a while ago. But honestly, summer isn’t a great time to potty train a child. We spend nearly all of our time at baseball fields, fairs, and other public places. Those places nearly always have porta-potties. So honestly, I didn’t push it until the fall hit. Our little guy is really getting the hang of potty training, and I’m looking forward to big savings by no longer buying diapers. We’re talking big savings here! The gift bags at the store were pricey. Even the smallest bag (that wouldn’t have fit what we’d bought anyway) was $2. I decided to try somewhere else. As we were checking out, I noticed the 99 cent grocery bags. They had a colorful one that would be perfect! I grabbed that and we were finished. Plus, the little girl can keep the bag for storing things! In our entire marriage, we’ve only had cable for 6 months. (That was before we had kids.) We mostly do just fine with our Netflix subscription. Anything else we want to watch can often be found online. The one thing my Hubby misses is sports. For some reason, many games have been moved to cable TV only. So when the big game for his favorite team was on, he wanted to find a way to watch it. He decided to use a free trial with Sling TV. Sling is a neat service, because it allows you to buy packages of channels at a lower price per month. So if you only need sports channels, you can get a chunk of them for $20 per month. It’s something we might consider doing once we’re beyond our #yearofno. But for now, he used the free trial and then cancelled. Hit the new “farmer’s market”. Have you heard of Fresh Thyme? It’s a new grocery store opening across the midwest. They dub themselves a “farmer’s market” style of store. They’ve had some really great deals! I was able to get 4 big bags of groceries for just $7. We’re talking 49 cents for a dozen eggs and more. If one opens in your area, I would definitely recommend checking it out. 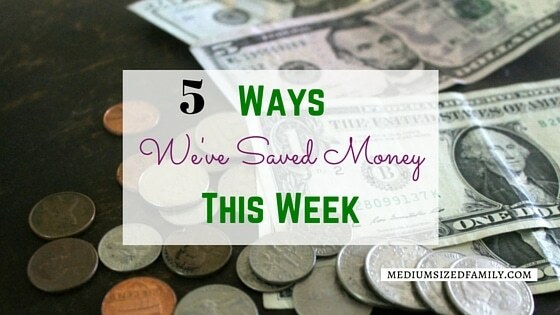 Those are the 5 Ways We’ve Saved Money This Week! I’m headed off to try out that witches broom idea next. I’m starting to get a kick out of this DIY thing! How have you saved this week? We’re really thinking about Sling, especially now that Jon has proved to himself that a good antenna gets more channels than our basic 15 channel cable deal. He really misses ESPN, but for now we go over to his parents’ house whenever there’s a can’t miss game. 99 cents is pretty great for bags. i got a Star Wars one at the dollar store this week that I’m saving for Jon’s birthday. I pretty much get all my gift bags at Dollar Tree. 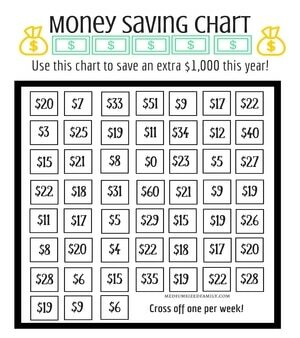 Smart ideas for saving money! Congrats on the potty training success! What great deals at Fresh Thyme. I hope we get one in our area soon. I love your bag idea! Smart thinking! I love this! My husband always changes our oil but I didn’t ever think about seeing if he could figure out how to change the breaks too 🙂 I especially love the creative idea of using the nice grocery bags as a gift bag! It’s always a victory when the kids are out of diapers…those things are expensive! I also love the idea of using the grocery bag as a gift bag. That’s pure genius and I’m going to start doing that too. It’s so much fun for the kid because it’s like two gifts in one! Thanks for sharing with us at Share The Wealth Sunday!